Water damaged drywall ceiling repair options with step by step instructions for replacing the damaged section and finishing the drywall. Water from the leaky shower drain dripped onto the basement drywall ceiling causing a fair amount of water damage. What appeared to be a simple stain on the finished ceiling is actually a hole on the unfinished side of the drywall. There are several methods to repair damaged drywall. The best option depends the extent of the damage (small or large area) and location (wall or ceiling). Drywall patches are widely available at home improvement stores that consist of a thin metal mesh with a sticky backing. The metal mesh provides support for the drywall spackle. The patch is stuck over the hole, spackle, sand and paint. Self-adhesive metal patches work best on walls and small holes, but often sag when used on ceilings. I therefore chose not to use a metal repair patch. The best way to repair the roughly 5″ by 5″ area of damaged drywall ceiling is to cut out the area and replace it with a new section of drywall by installing a wood reinforcement frame, tape the joints, apply joint compound, sand and paint. The most difficult part was working on the extension ladder to reach the high ceiling. The problem with Options 1 and 2 are if the leak were to happen again, you’ll be redoing the ceiling repairs. Depending on the nature of the leak, it may be necessary to cut an opening in the ceiling to fix the plumbing. In the 3 years since I made this repair, I’ve been introduced to the bauco drywall access panels. The bauco access panel solves both the repair and plumbing access problems. If I were to do this repair again, I’d use the bauco access panel. bauco rondo Drywall Access Panel by Access Panel Solutions, Inc.
Drywall Screw Setter – automatically sets the drywall screw the right depth every time. A 4-pack costs $5. Roll of Self-Stick Fiberglass Drywall Tape. Cost is about $8. Drywall Joint Compound. A 1 gallon bucket cost about $6. 2ft x 2ft x 1/2in Drywall Repair Panel. Cost about $4 at Home Depot. A large drop cloth is also needed to keep debris and dust off the floor. Before you cut out the damaged section of ceiling, know what’s on the other side of the drywall. Are there electrical wires, plumbing, gas lines, HVAC ducts, wood joists or metal support runners? I knew from looking into the ceiling crawlspace the center of the leak was close to the drywall suspended ceiling metal supports. If you can’t see what’s on the other side, cut a small inspection hole in the drywall with a utility knife and look inside with flashlight and small mirror. This repair is continued in How to Repair Drywall Ceiling Water Damage – Part 2. We recently had our bathroom ceiling repainted, we had not had any peeling problem over the shower, now it is flaking off. Can this be fixed by using another type of paint? Paint requires a clean and dry surface, then allowed to fully cure before exposed to the steam & humidity from the shower. The peeling paint will have to be scraped off. What type of paint did you use? I prefer Sherwin-Williams and Benjamin Moore premium interior latex paints. It’s expensive but I’ve never had a problem. I recently had a leak in a small area of my family room and I wondering if that would automatically necessitate the need to change the drywall. I am worried about mold though there is no evidence of it being anywhere. All i see is some water staining. Can i just paint it over or do you recommend puncturing the ceiling drywall and looking for mold? A quick & easy test is to paint the ceiling and if the water stain reappears, you now know the leak is still active and it’s time to open up the ceiling to find and repair the leak. Yes I am confident that the leak was stopped. There have been many rain storms, for example, since the leak was fixed and all has held up. The leak had occurred under a flat rubber roof. My question though please is how would I know if Mold is present after I patch things up? Would the ceiling just get discolored? Can mold live in the ceiling, for example, and not show itself anywhere? Anything you can recommend that can test air quality for mold? The only way to know if mold is present is to visually inspect the area above the drywall ceiling. Mold requires moisture or high humidity to grow. If the roof leak was fixed soon after the ceiling water stain was noticed there may be minimal or no mold. > Anything you can recommend that can test air quality for mold? “Who can test my home or clean, fix and remediate my home for mold? We recently purchased our first home, and before we actually moved in, we went in & turned on the water line for the refrigerator and went back to our hotel. The next afternoon we came to drop some things off and found puddles of water all over the basement bathroom floor, which happens to be just under the kitchen/fridge area. After cleaning the initial mess of water and stopping the leak, there is obvious water damage to the walls in the downstairs bathroom, as well as a mildew smell from the kitchen sink area (which was not present before the disaster). We are very concerned about mold growth and impatiently waiting for the homeowners insurance company to call us back with someone to come out and inspect. Would you recommend tearing out the entire drywall portion of the bathroom wall where the damage is? Unfortunately it goes across about half of the wall. :( Any suggestions would be great!! The first priority is the dry out the basement wall. This is usually accomplished by cutting out an 18 inch high strip of drywall above the floor and running fans for several days. A portable dehumidifier in the basement can speed the drying process. See the Hidden Mold Contamination article on InspectAPedia for details about cutting test holes and mold inspection. Call your homeowner’s insurance company before cutting away a long strip of drywall to ensure you’re not giving up any policy rights or causing “unrelated” repair costs they may claim are your doing. I’m surprised your insurance didn’t send an adjuster out right away and arrange for a water damage restoration company like SERVPRO. The longer it stays wet the more extensive and expensive the repairs can be. Fortunately the overflow was clean water and you caught the problem right away. Pull the carpet and underlayment up so it and the subfloor can dry. A fan will speed drying. Wait at least one week for the ceiling to dry and assess the extent of the water damage. If the drywall ceiling isn’t soft, sagging or the drywall paper puckered and you only see water stains, then painting it should be sufficient. My daughter found it fun to pour water out of the bathroom tub upstairs. It seeped through under the toilet, which obviously was not calked properly. Anyways, it’s now showing up on our downstairs ceiling and also poured through our air vent. Its covering a 2ft area. What should I do? No a lot you can do but wait for the floor and ceiling to dry then paint over any water stains. A one-time, short duration and limited volume water leak isn’t likely cause any real damage. Hello bob.. just recently my drian for washer was not put into wall drain so i full rinse cycle ended up on washroom floor witch seeped through the cieling downstairs. What would you recommend we do as of now? Cut holes to dry out cieling or just wait and paint? Please see my reply to Joelle dated Oct. 27, 2015 who also had a similar one-time overflow. > How do I know if the garage ceiling needs to be replaced or not? Wait a week or two then get on a step ladder and press against the drywall ceiling. 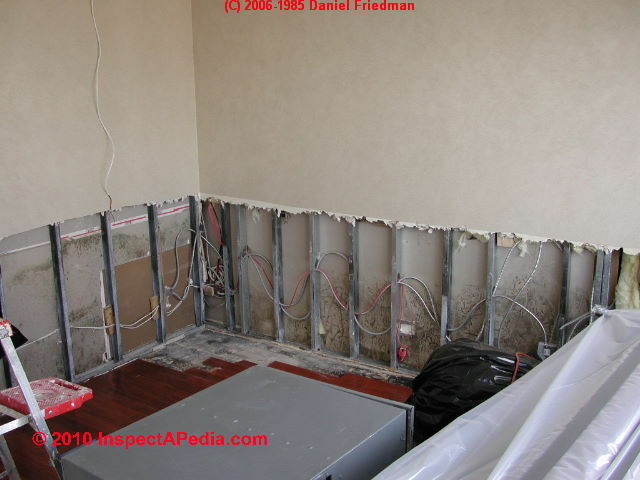 If the drywall is rigid and not sagging or pulling loose then it’s probably OK. Brief, limited volume, one-time floods often just dampen the drywall but doesn’t cause any real damage. > are in areas where the sheet rock is affixed to the wood above. Overall drywall is simple to replace. Simple doesn’t mean easy but it can be done. See Leaking Polybutylene Pipe Replacement for details. I have friend who has mold on all her shoes in her closet and on other things thorugh out her apartment she has called the office did a work order but they can not find the problem . this apartment complex has has alot water leaks i feel have not been took care of in the right way . help please . The roof and plumbing needs to be thoroughly checked for leaks. The apartment management often isn’t willing to thoroughly investigate because it leads to expensive repairs and they hope the residents won’t stand up for themselves. Check the terms of your lease for the proper method to document and file a complaint. Take photos and clearly explain the unhealthy conditions and urgency. Ask for a written reply explaining their plan and timeline to remedy the problem. Keep detailed records and notes. If the management isn’t acting in a timely manner to identify and fix the problem contact your local environmental health department to file a complaint. Your local TV station may have a consumer advocate which can be helpful through media exposure. I had a water stain on a downstairs ceiling (under the kids upstairs bathroom). A plumber came and cut a square of drywall out and checked the pipes, etc. They didn’t find any leaks and mentioned caulking the edge of the tub along the floor tile, which we did. Fast forward a couple of years and I now have light staining around the area where the square was cut and subsequently put back up. The stain is slightly yellowish. Does this sound like the result of a poor repair job, or do we still have some kind of very slow leak? The mistake was patching the ceiling a couple of years ago without identifying the cause of leak. If it’s necessary to have a hole in the drywall ceiling for a week or two to find the leak, so be it because slow leaks may appear only under certain conditions. As you describe it nothing was repaired. Caulking the joint along the tub and tile floor was guesswork. It’d take a lot of water on the floor to stain the ceiling so I doubt that was ever the problem. Assuming you have children, you’d know if they splashed water out of the tub. I’d reopen the access hole in the drywall ceiling and look for leaks and dried water trails. If it’s still a mystery wrap a section of toilet paper tissue around the P-trap and water pipes, securing it a piece of tape. Toilet paper is an excellent tell-tale that will reveal the smallest leaks. Bob, we discovered a new water stain on our kitchen ceiling earlier this month. Directly above is a bathroom with a tile shower to the left of the stain, a toilet to the right. Once we noticed the stain, I was able to dig a fingernail into the drywall and noticed a 1/2″ length of drywall tape had separated from the ceiling in the stained area. I headed upstairs. The toilet has an access panel next to it and everything in that space looked dry and clean. Ditto for the shower wet wall. I removed an astonishing clog from the shower drain and took a “wait and see” approach for the past few weeks. The ceiling is and has been dry to the touch for 3 weeks, and the stain hasn’t grown in size, but it has darkened. Any thoughts on opening up that ceiling and looking further vs. painting it with Kilz and giving it another few months to watchful waiting? Was water filling up the shower pan or backing up in the drain before you removed the clog? If water was filling the pan it may have leaked at pan and wall seam. If water was only backing up in the drain it probably leaked at the rubber gasket under the pan. Water normally shoots past the gasket but standing water has more time to wick it’s way through. The leak stops when the water drops below the gasket as it slowly drains past the clog. Now that you’ve removed the clog the drain is still leaking but not so much as to noticeably wet the ceiling. Eventually the leak will get worse so best replace the gasket to prevent greater problems down the road. I believe the latter scenario is most likely. The shower pan never showed signs of a clog. Sadly, it is a tile shower so accessing the pan could be a challenge beyond my skill set. Last night, curiosity got the best of me and I drilled three small inspection holes in the ceiling. Hole #1 – 4″ right of the stain’s epicenter revealed a healthy amount of insulation and dry surfaces as far as the camera could reach. Hole #3 – 4″ left of epicenter, revealed more joist to the side of Hole #2 (nuts to my junky stud finder) but no dampness. This morning I stuck a paper towel in Hole 2 while my wife showered above. The towel came away barely damp after a 10-minute shower, so something small is finding its way to the floor joist. There is also a toilet in that bathroom that had to be vigorously plunged twice this season. I suppose it could have a blown wax ring but the state of the shower clog has me thinking it is the more likely culprit. Now that I’ve got holes in the ceiling, I’ll probably just call in a plumber and hope for the best. I just read another apartment issue and would like some feedback on my problem. Early last Thursday we noticed a stain beginning to develop in the bathroom above the toilet and could hear water dripping in the ceiling above from the apartment above us. We attempted to get a hold of our emergency maintenance team with no response. Fast forward an hour later and the stain got worse and dripping began from our ceiling. Hours later the maintenance team was able to fix the problem upstairs by shutting off the water and claiming a supply line broke. An outside drywall guy came by, drilled 3 holes in the ceiling and said let this slow drip continue until I come back in order to let the drywall above dry out and I will come back and patch it when it dries. The gentleman came back today (1 week later) and simply patched the 3 holes he drilled and says they will come by and paint to finish. I was under the impression that because the leak lasted hours and created a large 2 ft x 2 ft stain that that entire piece of the ceiling was going to be replaced. Should we be concerned with how this is being handled? If the drywall isn’t sagging or the paper face peeling off then a patch & paint should suffice. A homeowner might opt to cut out and replace the section of drywall but apartment managers focus on managing costs. Dear Bob, Years ago (about 10), there was a pinhole is a copper pipe in the wall behind an upstairs toilet that eventually dripped long enough to ruin the dining room ceiling below it (homeowner’s claim). Had pipe repaired and ripped out a large portion of dining ceiling, checked for moisture, waited, then had it repaired. Note, please, the house is now only 19 years old. Since then, the “tape” used for the repair opened twice more (more repairs by same guy), then twice again (different guy). Now, in the SAME AREA (this is killing me!) I am seeing a bubble about 3.5″ long by 3/4-1″ wide. The bubble is NOT wet; it is dry and, if you tap it with your nail, you can hear it’s hallow. My handyman said I should open it about 1×1 feet and leave it open for a month to see if I get any water dripping (of course, leaving something plastic with maybe a paper towel on the DR table to protect it. Problem is the upstairs hall bath is never used (only twice a month that the housekeeper cleans it and on the occasional instance that someone uses the toilet – – just myself and hubby live there). What would you suggest? Both upstairs bathrooms have been completely remodeled over the last 5 years. I’m stumped! Those small slow leaks can be the most aggravating to locate! See my reply to Ralph dated May 5, 2015 about drilling a small hole in the ceiling to insert a snake inspection camera. You might get lucky and find the leak right away or at least have a better idea of where to cut a larger access hole. If you decide to cut a 12×12 inch hole in the ceiling see my advice to Deborah dated Aug. 12, 2016 about using toilet tissue as tell-tale. I also use toilet tissue to check for leaks when assembling valves, hoses and traps. It’s sometimes hard to tell by feel if the pipe is just cold, or it’s cold because it’s wet. Toilet tissue will reveal the smallest drop of water. Best of all it becomes rigid after drying to catch those intermittent leaks. Hey Bob, last year our whole roof was replaced. After the job was done we notice when it rained it was leaking around the air vent, the roofers came back out and fixed the leak but we have stains in the ceiling, the drywall is dry but stained now. What would you suggest? Inspect the stained drywall from inside the attic for damage. If the leak was only cosmetic then paint ceiling. If the roof leak was fixed right away then mold shouldn’t be a problem. It helps that attics are hot dry out quickly. The paper face of the drywall ceiling and/or popcorn ceiling texture may have delaminated at the wet spots on the ceiling. Hence the bubble you feel when pressing against it. It’s easy but messy to scrape off and repair. May have to paint the entire ceiling for color match between the old and new texture. How do u install Sheetrock on a bathroom ceiling that already has tile walls? Remove the old ceiling material to expose the joists then install the Sheetrock. You’ll need to install at least two smaller panels to fit the edges over the top of the wall tile. How to Build a Basement Closet: Ceiling Drywall may be helpful. We found a roof leak during Hurrican Harvey, it was coming through the fire alarm in the guest room. They replaced the fire alarm, but I still see a water stain ring around the fire alarm, the builder said the painter will handle it. Our house is still under warranty, shouldn’t they cut out the damaged area and replace the sheetrock or just paint over it? It sounds like they just want to paint over it. If the leak was relatively small and brief such that the paper face of the drywall didn’t delaminate and the drywall feels solid when you tap or press on it then painting is all that needed. I had a similar problem with cracked rubber boot on my drain-waste vent (DWV) pipe. Water stain on the ceiling, check the condition of the attic-side drywall and found it was structurally sound. Fixed the rubber boot and painted the ceiling. I purchased a home about 2 years ago and am in the process of fixing it up. I’m removing the popcorn ceilings. There was an old roof repair and my house didn’t have active leaks when I purchased. One of the rooms I’m scraping had a water leak that they painted over but the Sheetrock has about a 1/2 inch sag and it covers 4 sq ft. Should the Sheetrock be cut out and replaced? If possible, go into the attic and lift up the insulation to inspect the condition of the drywall ceiling and joists. Then you’ll know if the leak was mainly cosmetic or if the drywall is badly degraded and the section should be cut out and replaced. Has the drywall ceiling pulled off the nail or screw heads? If so, you’ll see holes especially in the sagging areas. You may be able to refasten the drywall by setting new screws into the joists. Use a drywall dimpler bit to automatically set the screw at the right depth as shown in this project. Mr. Bob Jackson, all of your replys, have been extremely helpful. Thank you for the information. I will use many if your repair suggestions. Hi Bob, I had a minor leak that required me to cut a hole in the plaster of my ceiling (caused by driving rain, roof has been fixed). It’s slightly disfigured and there’s a spot where I also accidentally rubbed some of the plaster off. Can I just replanted it and paint once I’m sure everything is dry or do I need to replace the Sheetrock? Shallow divots and craters in the drywall can be filled with joint compound and sanded smooth. Apply several thin coats and allow to dry between coats to build up the thickness. Hi Bob, We had a toilet leaking above our finished basement ceiling. Toilet was leaking at the wax ring. Toilet is repaired. However there are still water stains on ceiling to repair and I am wondering if I need to cut open drywall and check for mold or should I just repaint? There are no signs of mold but plumber suggested we check for it. I hate to cut open ceiling if we don’t need to. Thanks for your advice! Locate a ceiling joist and cut an inspection hole with a 4-1/4″ hole saw. This will be large enough to look inside with a flashlight and handheld mirror. If there’s no mold or extensive drywall damage, permanently patch the drywall or install a metal blank off cover plate.